Playing tennis at Flushing Meadows, home of the U.S. Open, isn't just for the tennis pros. The U.S. Tennis Association's Billie Jean King National Tennis Center in Flushing Meadows, Queens, New York, is the home of the U.S. Open Tennis Tournament, and for 11 months of the year, the tennis center is open to the public for play. It's closed to the public during the U.S. Open tournament and qualifying events for one month every summer and on Thanksgiving, Christmas, and New Year's Day. The Billie Jean King National Tennis Center is the largest facility open to the tennis-playing public in the world. The courts are open every day year-round except as noted from 7 a.m. to midnight. Rates per hour differ for indoor courts depending on what time of day you want to play, and they are slightly different on the weekends than from Monday through Friday. You can also play on outdoor courts, and those hourly rates are the same all day, every day. The center has 12 indoor Deco-Turf courts, 19 outdoor (field) courts, and three stadium courts, which are for professional championship play. Book your reservation on the center's website or call the tennis center to reserve a court. You can make a reservation up to two days in advance, but you must cancel 24 hours before you are scheduled to play if you find you can't make it at that time. You can also make reservations for tennis lessons given by pros at the tennis center. Rates vary depending on when you schedule your lesson. Access to the tennis center is often limited to the west gate and its adjacent parking lot. Ask when reserving your court for the best way to enter and where to park. 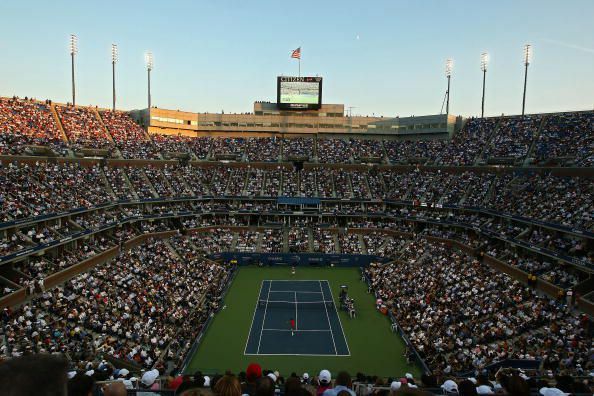 The U.S. Open Tennis Championships, which take place August 26 to September 8, 2019, will be held at the brand new Louis Armstrong Stadium, which has 14,000 seats and a retractable roof. It is the first naturally ventilated stadium (with louvers on two sides) with a retractable roof in the world. Arthur Ashe Stadium, built in 1997, is the world's largest outdoor tennis venue and the center's main stadium with 22,547 seats, five restaurants, and a two-level players' lounge. It recently was fitted with a new retractable roof. An all-new Grandstand Stadium seats 8,125 people. The first U.S. Open was played in August 1881 on grass courts in Newport, Rhode Island. The Open was moved in 1915 to the West Side Tennis Club in Forest Hills, Queens, where it stayed until 1977. The U.S. Open moved to the National Tennis Center in Flushing Meadows in 1978. The Singer Bowl, on the site of the 1964 New York World's Fair, was renovated and divided and became the original Louis Armstrong and Grandstand stadiums. The new Louis Armstrong Stadium stands on the same footprint as the original two stadiums. How Will Rain Affect Your US Open Tennis Tickets?